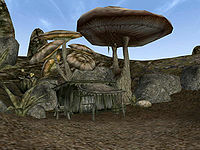 Rayna Drolan's Shack is a pilgrim's hut located on a medium-sized island northwest of Dagon Fel. The only resident, Rayna Drolan, is a hermit who has taken a vow of silence. In a bet with Sheogorath, Azura sent Drolan to this remote island to be completely isolated for 100 years with the aim of proving that isolation invokes meditation rather than insanity. With the time almost up, the mischievous Sheogorath tries to drive the priestess mad by sending his Daedra after her. The interior of the shack is quite small, largely filled with containers containing food to support Rayna in her life of isolation. When you enter the shack, you fill find a wooden barrel with a cloth sack on top of it that both contain random food. To the right of the entrance are some empty barrels and an open crate. Just past the entrance is a table that has a candle, some cheap silverware, and a single piece of gold resting on top of it. Parallel to the table is a hammock with three sacks underneath it that all contain random food. In the corner of the room behind the hammock is an empty crate with a bottle and a wooden barrel on top of it and another barrel situated beside it. The wooden barrel contains more food while the other barrel beside the crate is entirely empty. This page was last modified on 8 September 2018, at 04:06.